After the attack simulation ended, Tris, Tobias, Caleb, Marcus, and a few others arrive at Amity, seeking for refuge. Tris learns the way that the people in Amity live, and they are always peaceful. One day the Erudite and Dauntless traitors arrive at the Amity and search for Abnegation and Dauntless. Tris, Tobias, Caleb, and susan escape successfully, and they get on a train. Surprisingly, the train is full of armed Factionless. They decide to bring them back to the factionless, because Tobias’s mother, Evelyn, is the leader of the Factionless. After a few days staying in the Factionless, Tris and Tobias head to the Candor, but they are arrest and are taken to the truth serum. A few days later, the Dauntless traitors attack the Candor to find the Divergents. The Dauntless select the leader and head back to Dauntless headquarter. Erudite simulates three Dauntlesses, and warn the Divergents. Feeling guilty for killing Will and people who die because of her, Tris sacrifices herself and arrive at Erudite. Jeanine does many experiments on Tris, and Tris survive because Peter saves her. Tobias, Tris, and Peter go back to the factionless, realizing that they team up and wants to attack the Erudite. 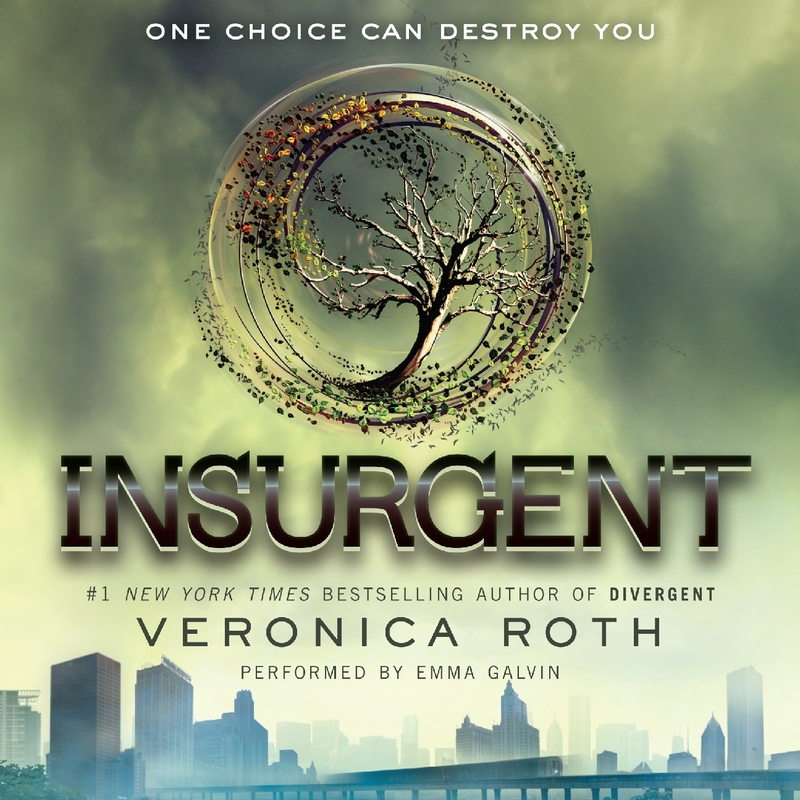 Tris lies to Tobias and works with Marcus, because she wants to find the file that her mother die for. During the attack, Tris successfully defeats her simulation-self and get the file. This book is great. The author uses many foreshadowing, and I can not stop reading once I started. The plot is unexpected and exciting, and the way that the author writes is simple and fast pace. There are also many great emotional moments, and it really touches my heart. The author has a really broad vocab, and the word choice are pretty advance. Every character’s life is different, but I can easily related to people that I know. For example, Tris is like one of my friends, she is brave and smart, but she is unwilling to take other people’s advice. The book would be best for teenagers and young adults, because the vocabularies are advanced, and there are also many violence and romance moments. I would also recommend this book to people who likes science fiction, actions, and romance. I really like this book, and I would choose this book again if I could go back in time. I would give this book a nine out of ten. 1. Why is Peter in Tris’s room in Amity? 1a. Peter is in Tris’s room because he is trying to find the hard drive. 2. Why is Amity always peaceful? 2a. Amity was always peaceful because they add peace serum in the breads. 3. Why does Tobias hates his mom? 3a. Tobias hates his mom because his mom left him with his dad , which he hates the most, when he was young. 4. Why are Tris and Tobias arrest when they go to the Candor? 4a. Tris and Tobias are arrested when they go to the Candor because the Candor thinks they run the attack simulation . 5. Why is Tobias mad at Tris? 5a. Tobias is mad at Tris because she did not tell him that she killed Will. 6. Why does the Erudite attacks the Candor? 6a. The Erudite attacks the Candor because they want to find all the Divergents and execute most of them and bring two back to the headquarter. 7. Why is Tori injured? 7a. Tori was injured because she was collecting informations from the Erudites, and she was caught by one of the Erudite. 8. Why does Tobias beats up his father publicly? 8a. Tobias beats up his father publicly because he needs to prove to everyone that he is not a coward, so he can be the leader of Dauntless, and he wants Dauntless to ally with the factionless. 9. Why does Eric wants Tobias to be the one who execute him? 9a. Eric wants Tobias to be the one who execute him because he wants Tobias to live rest of his life with guilt. 10. Why does Tris go to the Erudite headquarter to sacrifice herself? 10a. Tris go to the Erudite headquarter to sacrifice herself because the Erudites warn her through simulation, if she does not go, more people would die, and she does not want others to die because of her selfishness. 11. Why does Tris not want to tell Jeanine the informations about the factionless safe houses? 11a. Tris does not want to tell Jeanine the informations about the factionless safe houses because the factionless are their last hope of stopping the Erudite. 12. Why does Jeanine know many informations about Tris? 12a. Jeanine knows many informations about Tris because her brother, Caleb, betrayed her family. 13. Why is Tris not dead after the execution? 13a.Tris is not dead after the execution because Peter betrays the Erudites and helps her get out of the Erudite. 14. Why does Tris lies to Tobias and helps Marcus? 14a. Tris lies to Tobias and helps Marcus because she wants to find out the truth about the secret file that her parents died for. 15. Why is Tris able to defeat her simulation-self and get through the door? 15a. Tris is able to defeat her simulation-self because she realizes that they have different goals, and she is desperate enough to fire a gun.